Thinking of going mobile? Already dabbled in mobile and been a little disappointed? Adding mobile to your business intelligence solution can help you get more people using business intelligence and drive a culture of data-driven decision making. But it's not always obvious how to get there. Here are 5 best practices that will help you focus your time and get the most out of mobile. 1. Take an author-once approach. Avoid the trap of dashboard proliferation. Don’t recreate each of your dashboards for every different device. Rather, take an “author-once, distribute everywhere” approach: plan to create your dashboards once or adapt existing dashboards, and make them available on all relevant devices. Of course, you need a BI solution that supports this approach. 2. Write to a smaller form factor. Smaller screen? You've got to use your space better. Place the most important view at the top of your dashboard. Be stingy with legends and filters, and for that matter views-- limit your dashboard to 2-4 important views. 10 views in a dashboard doesn't work on the go! 3. Consider an audience on the go. When your users are mobile, you can’t assume they have time to dig in. So make it easy for them. Allow drill-down. Provide filters that let them find location-specific information, like filters on city or customer. Provide content search so they can find the right dashboard to begin with, because if users can't find the data, it's useless. 4. Account for new mobile scenarios. 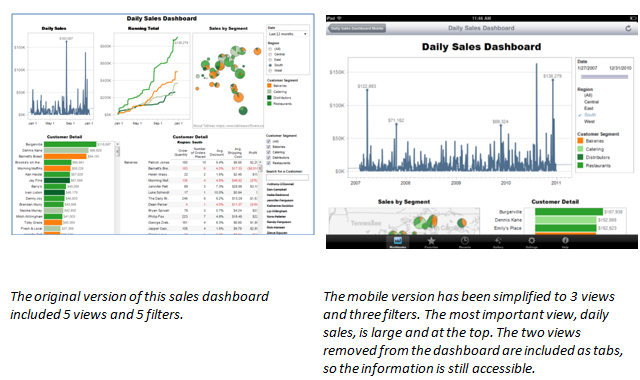 To follow each of the first three best practices, you could modify existing dashboards. But occasionally there will be a big payoff in designing new mobile views. Look at all your dashboards and ask yourself if something is missing-- a dashboard optimized for a manager on site at a plant, for example. 5. Leverage mobile’s natural process of collaboration. Provide highly interactive views so people users can walk through data live. Allow commenting on a view. And finally, make sure your mobile BI is fast enough to keep up with a discussion. People won't stop to wait for a view to load. And not listed as a best practice, because it's absolutely a prerequisite, is to have a mobile solution that supports your existing data security and authentication. Because mobile BI is great, but do you really want all your data to be public? Without the right security, it will be. A new whitepaper goes into more depth on these points. Discovered a best practice not listed here? Comment and start the discussion.